The intrinsic nature of Yoga practitioners is to explore. The ancient texts of the great Yoga masters have laid out an intricate map to guide seekers along this path of discovery. But the deeper we go, the more likely we are to encounter an overwhelming plethora of Yoga practices, complex philosophies and seemingly contradictory teachings. The Power of Yoga is a book for Yoga enthusiasts who find themselves at this crucial juncture of their journey. The book is a comprehensive guide that enables the committed practitioner to delve deeper into his or her practice, and do so more mindfully and efficiently. Piercing through the esoteric mist that surrounds the philosophy of Yoga, Thee Power of Yoga is a practical companion that teaches, demystifies and holds ?hand through the ups and downs of your daily Yoga practice. While the sutras have given us the road map to understand the path of Yoga, The Power of Yoga makes it accessible to the modern-day practitioner and speaks in a language which he or she can relate to, without taking away from the authenticity of the technique. Ultimately, the book seeks to bring readers closer to the deeper meaning of Yoga and trigger curiosity to explore it even further. While there are a zillion books that have sought to explain the different dimensions and perspectives on Yoga and its accompanying sub-types, The Power of Yoga is a one-of-its-kind, hands-on guide that takes the personalized and customized approach to Yoga. It offers Yoga lovers the opportunity to get right to the heart of Hatha Yoga, through a DIY or experiential route – it does this by providing a unique and comprehensive manual of ‘asana sequences’ mapped out for life-style based circumstances (from routine stress to preparing to cope jet lag), physical ailments and work styles. Culled from years of teaching and learning Yoga, these sequences help incorporate combinations of the thousands of recorded asanas into tailor made daily practice to suit particular lifestyles. The user can choose routines according to the levels of emotional, mental and physical fitness that he or she would like to reach for at any given day, week, or phase. 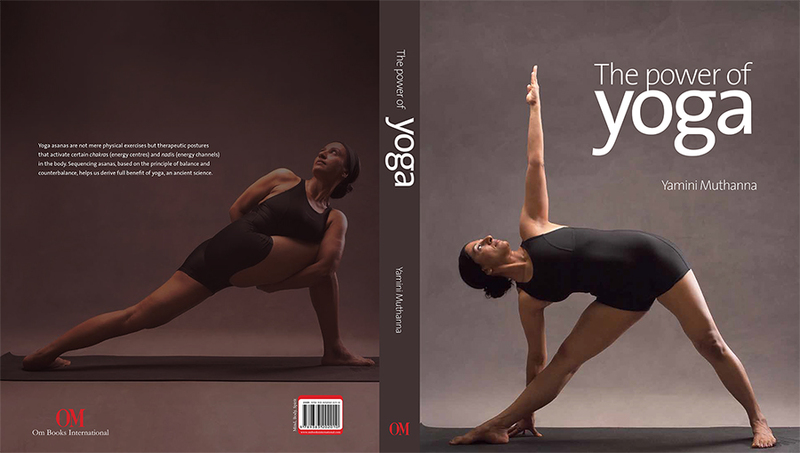 With bold visuals, illustrations and a go-to sequence manual, the book aims to be a dynamic and user-friendly guide to Yoga, rather than a stodgy reference book on it. A section of the book. Today’s women is beyond definition. She is much more than what she is traditionally referred to as a mother, a housewife or a daughter. Her role extends beyond the foray of boundaries. She plays a unique role in the society. She is strong and dynamic, multifaceted and skilled and is constantly striving for perfection in every aspect of her life. To play her roles well as super woman she needs to be aware that her body is a mystery box which needs to be taken care of at every stage of her life. She should not be taken by surprise when her body poses a challenge as days go by. She has to however carry on her roles with dignity, grace, flair and perfection. This book opens up as a guide to face these challenges. Power of Yoga for women is a practical book that demystifies the challenges of womanhood and introduces a practice and understanding to yoga to maintain good health, mental peace and poise in life. This book offers a well planned Yoga practice exclusively for women which can be modified and adapted into the changing needs of a women in different stages of her life, helping her achieve mental peace and bodily poise. 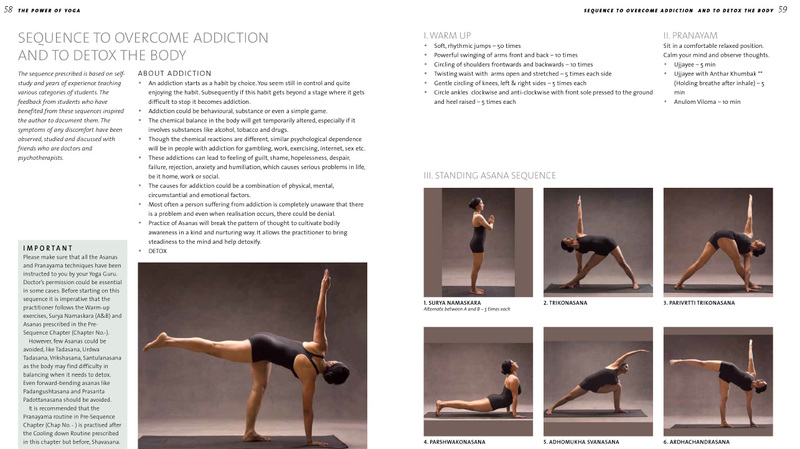 The book features a variety of asanas and pranayama techniques which can be practiced as a yoga routine or integrated into a work out routine of her choice. Right from adolescence to motherhood, menopause to old age, women undergo many physical changes. Those changes in the body chemistry can cause major mood swings creating disharmony and imbalance in the body. The book provides simple explanations to the cause and effect of these changes. It provides practical yoga advice and an asana practice routine to cope with these obvious changes. The book is divided into 5 sections 1. Adolescence (covering menstruation, muscular development, obesity etc) 2. Womanhood (covering conception) 3. Pregnancy (covering prenatal and postnatal yoga asanas and pranayama), 4. Transitional age (dealing with menopause) and 5. Golden years. With simple prose, precise instructions and a perspective evolved from personal experience, the book acts as a best friend and Yoga instructor. It can be used as a companion and a guide to women of all ages to structure their road to good health both physical and mental. This would also be a good book to all those men who loves their women to understand them better. The book has knowledge which is practical and easy to understand with appropriate explanation to the various stages of a woman. The book will have pictures of important asanas which are beneficial at each stage along with a sequence to aid a regular practice. It is a book for every woman who would want her journey into the golden years to be well planned, graceful and peaceful. It could be a refusal to do a homework or eat food, maybe not interested to do anything at all or finding it difficult to cope the pressure, whatever the trigger we all know our child is heading towards a meltdown. I am a parent, a teacher of performing arts and a Yoga Acharya I help children learn the art to express emotions and manège them artistically. At an average I meet at least a 100 children from various backgrounds, countries and aptitude for art daily. Some keen to learn, some not keen to learn, but parents are keen they learn etc. Some kids are extremely skilled and know they have an aptitude for classical art but are not hardworking enough and some are hardworking and would challenge themselves to break through their barrier of lack in skill with consistency and effort. Its a struggle all children go through as they are monitored by very eager parents who want their child to excel. At all times children are going through a processing about whatever it is they need to do. They are stuck between their instincts and the guidance of their loving parents, which results in a mental reaction and eventually to a physical one. Physical ones are more obvious than the mental ones. But it should be noted that the mental ones results in the physical ones. The overwhelming feeling the child is experiencing soon manifests as physical sensations and results in stress. Therefore addressing these reactions in the body with some Yoga is a good place to start. This book provides 21 Yoga poses along with a Surya Namaskara to help general health and most importantly help support seemingly troubled moments and help deal with it calm and composed. This book is uncomplicated and deals with guided instructions and guidance to help kids enjoy the practice of Yoga and eventually get sucked into the discipline and focus it inculcates. The sequence introduced here are traditional, simple and easy to remember as it involves pictures and illustrations of various child friendly Yoga poses demonstrated by senior students of Yoga under guidance. However, it would be my advise if a child aspires to practice yoga he/she initially gets a hands on instruction under an experienced Guru for better alignment and construction of the asanas. The book provides step by step instructions to perform Asanas but correction and technique is best done by a teacher who watches the child perform. The book does not replace a Guru. The sequencing pattern and asanas are suitable for kids between age group 5 to 15. They can practice the asanas mentioned along with Surya Namaskar or practice them along with their sports routine if they are into sports.